The era of the Cloud has arrived. Early adopters jumped in and have been swimming around in the misty globules above the earth for some time now. And the rest of the world is joining in, personally, professionally, and theoretically. But the Cloud really isn’t in the sky. It’s more like it’s an extension of your fingertips, and an outreach of your brain, and in reach of your computer’s processing power. Have you embraced it yet, you technological wizard, you? If you missed the early train, you still might need a briefer on the Cloud, but after that, you can decipher where in the puzzle infrastructure, personal and business use, media consumption, and storage security fit. It’s all as fascinating as it is practical. The Cloud isn’t literal. For practical purposes, it’s really just comprised of sets of server farms that do work and store data, but these farms are places that you can’t see, and because of how they’re connected, they act independently and ‘virtually,’ being able to swap out necessary processes and functions on the fly. Reading the history of where the Cloud came from will get you more details about that matter as well. Now that the Cloud has evolved to its current position and status, the next question for you might be how the Cloud affects company infrastructure. Depending on the size of your business, the answer could be quite variant. For companies with deep legacy structures, transferring operations to the Cloud can save a ton of money and resources, but the move to that new way of doing business can be quite complicated to initiate. On a business level, you’ll probably be dealing with gigantic software packages, consultations, and custom work. But on a personal level, the Cloud tends to be much easier to handle. Essentially you just choose the cloud services you’d like to work with (Google and Apple have them built in, and DropBox is a cross-platform staple), and then all of your machines and devices will automatically begin syncing – easy as pie. 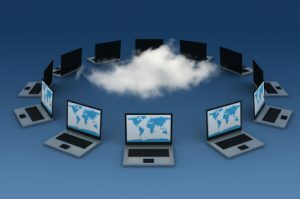 In terms of media consumption, the Cloud allows for lots more streaming capability all around. Netflix, Hulu, Apple Music – any of the places where streaming and downloading occur, eventually that all ends up coming from cloud servers. And the Cloud isn’t necessarily just about doing things, it’s also about storing things. If you’ve ever had nightmares about your hard drives dying, and losing all of your data, then you know that the Cloud can really save your keister, especially if you have work-related projects that need to be kept secure.